Diggers Valley: 13 - 26 August 2005. The weeks beginning 13th and 20th August 2005. I spent a lovely couple of days in Auckland with Jude, Roger, Stella and Jasper. I had a ball on Saturday night - literally, having been invited to accompany my friend Zoe to the annual Lesbian Ball, at which I met up with a number of old friends, many of whom I haven't seen since I left Auckland at the end of 1995! I'm not entirely sure why DJs assault their listeners with quite so much noise - I don't think I'm becoming an old fogey in protesting against sound which causes pain and leaves one's ears ringing for days! The music was great, just far, far too loud! Fortunately there was a comfortable area outside the main room where conversations could be conducted at normal volume. Flying home today from Auckland, was an unusual passenger, although I'm sure he and his human had done this before! 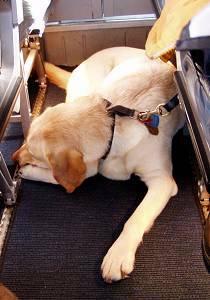 Prince is a guide-dog for his blind companion - I don't think ordinary dogs are allowed to travel in such comfort. The internet auction for the back-blade Stephan went to look at on the way home from Whangarei on Thursday was due to close just after 8.30pm on Saturday evening, so after a couple of conversations with Stephan, I put in an auto-bid up to $600 and this morning checked and discovered we'd won the auction, buying the blade for $575, which we both feel pretty chuffed about! Over the last four years, I've written these pages with a mix of farming and personal material, tending mostly toward the factual and useful for those who are involved in the same sort of life and work, and for others who might like to live it and therefore enjoy seeing the variety this lifestyle provides. Occasionally I dip into my own thoughts on particular issues, but have chosen not to go too far down that track, partly from a sense of wanting to preserve my own privacy and also for fear of boring anyone! Writing this page on Monday the 5th of September, when life is good and normal again, I've decided to record some of our last three weeks' trauma! It was hell to live through, but has left me with some interesting lessons - and it has very little to do with farming, so if you'd prefer to avoid personal revelations, you may skip to the next bit. When I got off the plane on Sunday afternoon, Stephan was there, talking to our friend Alan, so I stopped and we chatted and laughed for a while and when the bags were unloaded we set off for home. Stephan was driving us out the gate over the cattle-stop and I realised he was suddenly extremely upset! He told me he'd had a phone-call from a nurse at our doctor's surgery on Friday afternoon, asking us both to come and see the doctor immediately! Discovering that I'd not be back until today, the nurse then went off to reorganise their Monday morning appointments to fit us in first thing - a fact which alarmed Stephan enormously, since around here you're lucky if you can get a doctor's appointment in three or four days' time. Poor Stephan spent the entire weekend fearing the worst and avoiding giving any hint of his fear at all during the two or three telephone conversations we had. I am enormously grateful to him for deciding not to tell me, so I could thoroughly enjoy my long-planned weekend away - I couldn't have done anything if I'd known, would only have worried and wanted to be at home. Both of us spent a sleepless night on Sunday, waiting for 8.30 on Monday morning. The surgeon was a little more positive, suggesting that all the lumpy bits could be cut out - that even livers, these days, can be resected successfully, increasing people's survival rates from cancer by considerable amounts. In discussion with him and a couple of the nurses, we all decided that there was time for me to do the three-day "emptying" diet in preparation for a colonoscopy on Thursday, so the surgeon could obtain a biopsy from two sites indicated in the barium enema x-ray. We then had a half-hour consultation with the anaesthetist, in preparation for a general anaesthetic to complete the colonoscopy (I have a nasty U-bend in there somewhere, which had prevented the completion of an earlier examination a few weeks ago under mild sedation). We left the hospital feeling that I was the system's most important patient - which is a very good way to feel when facing an appalling future. There is much talk about the inadequacy of the health system, which is freely provided to New Zealanders, funded by our taxes. We pay for any prescription medicines and for General Practitioner (doctor) visits and those with the resources to do so can pay for private specialist and hospital treatment and/or health insurance, which is beyond the means of most people, particularly in this community. If one's needs are not considered particularly urgent, one can be required to wait for treatment (although in this part of the country those waiting lists are significantly shorter than elsewhere), but if a need is urgent, the system is obviously capable of responding incredibly quickly. Not knowing quite how to cope with this awful news, we went and talked with a very nice Relationship Services counsellor, who helped us work out how and who to tell, whether or not we actually needed to tell anyone at all, that it was just fine to bare-facedly lie to people who asked how we were ... "we're fine", silently screaming "NO WE'RE NOT!!!" We worked out what our priorities might be for the next few days, how we'd support each other, where else we'd get emotional support, and so on. That was a tremendously useful hour and a half. So for the third time in six weeks I ate very little for two days and starved on the third, able to drink clear fluids and sugar, which doesn't do much to provide sustained energy or body heat. Early on Thursday morning we went to the hospital. The surgeon dashed through the reception area on his way to the ward and said the Liver specialist team in Auckland had examined the CT scan and determined that the tumour on my liver wasn't malignant at all. Excellent news! Waking up after the anaesthetic later on, the theatre nurse told us that there had been no evidence of any tumour in my bowel, so no biopsy had been taken. Things were looking surprisingly good. I was referred back to Whangarei for a repeat Barium Enema x-ray examination to see if the previous result could be repeated and after a bit of proactive stirring over a couple of days, that was booked for Tuesday the 30th - I had suggested that having told me I was probably dying (with a 50/50 chance of survival to five years) the least they could do was make the next part of the process happen in a timely manner. After starving for the fourth time in two months (not to mention the other very unpleasant part of the process, involving a very effective laxative) we went off to Whangarei for the second barium enema examination, during which the radiologist told me what he was seeing, which was all "unequivocally normal". I was then shown both sets of x-rays in explanation of how we'd been set off down the whole awful train of life-threatening news! There were two very distinct areas of quite abnormal restriction in the first x-ray, which were completely absent in the second. Some evidence of trouble in that same area had also shown up in the CT scan, which provided back-up for the presumption that I was harbouring significant malignancy in that area. We went for a follow-up consultation with a surgeon back in Kaitaia on the following day, and the last thing to do is to have a MRI scan of my liver, to confirm that the mass therein is definitely benign. Bearing in mind my general good health, it is unlikely that there's anything to worry about - so I won't. That will apparently happen some time in the next few weeks. We both feel a huge sense of relief, coupled with a sort of confused irritation at having had to go through this awful process! I feel as I imagine people do when their teenage child is out too late and they've heard there's been a car crash and that several have been injured and then the child walks in the door - the first reaction is joyful relief, then an overpowering urge to throttle the cause of the anxiety! There is no body to throttle, in my case, so I have just had to wait for that feeling to subside. when dealing with the prospect of facing one's own death, hiding seems a very natural reaction. I really didn't want to talk to anyone, because it was already too overwhelming to deal with my own reaction to the news, without having to face anyone else's, let alone comfort them in their distress. Writing - the old fashioned sort on paper, or by email - is an excellent way of communicating at such times, because one may receive and respond to communications when one is ready to do so, rather than at a time chosen by a telephone caller. if you insist on telling someone everything will be fine, be prepared to provide that in writing and be willing to face posthumous lawsuits - and if you're right, "I told you so" may not go down very well! I took Stephan up to the airport and sent him off to Auckland for a few days to help Jude and Roger with some work on their house and came home to move some cattle around the farm. I keep looking at Ivy, checking on her general condition, to ensure she's getting enough to eat and also wondering what, or rather how many, she's carrying in that rather wide belly! 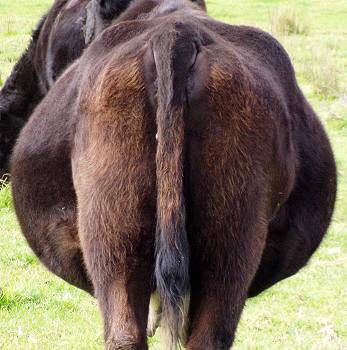 She's not a fat cow, but she's getting pretty ancient and still has cover in the places one looks for condition indicators, like over her short ribs and around the base of her tail. Her coat is a bit light in colour, which may indicate a bit of stress and/or a shortage of copper, although I've noticed with Ivy that she doesn't grow new coat hair as quickly as the younger animals, so the lightness of the hair may be indicative of its age and fading, rather than a current deficiency. She and the first-time pregnant heifers have only had one copper injection this winter and are due another before they get too much closer to calving. Ivy is theoretically due to calve from around the middle of October, but I'll be watching her carefully from the beginning of the month, since she surprised me by producing last year's twins 15 days earlier than I expected. 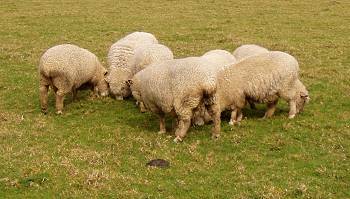 I swore I wouldn't do this, but here are the sheep, back on the flats again! We stopped culling their number when the neighbours at the front asked if we'd graze their land for them, but they've now sold the property and I haven't yet arranged for the butcher to process a few more sheep into mince and sausages. There are three of the elder ewes and an undershot-jawed wether to go, which will lighten the grazing load a little more, so they can live exclusively away from the main part of the farm - at least until next spring when I'll hope to have a few lambs again. Off again this afternoon, this time courtesy of my English cousin, Chris, on a flight to Auckland to meet up with him for the first time since early in 1989. He has managed to arrange to stop over in Auckland on his way from Texas, USA, to Thailand! Stephan's already down there with Jude and Roger, so I'll join them all at Jude's place for a concentrated family reunion. 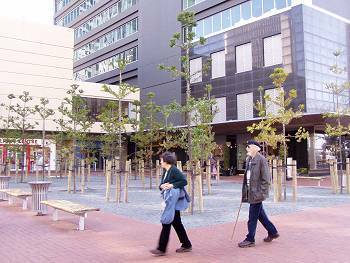 This amazed and wryly amused me: this is the QEII Square at the bottom of Queen Street in Auckland and this site used to contain an extraordinary sculpture which was I think some sort of wind chime and now has been planted with multiple Kauri trees. In a thousand years time, somebody will rue this particular decision! I think it's a bit sad that such wonderful trees are planted in such a way and place that they'll obviously have to be removed quite early in their lives - or they'll create significant problems! Kauri trees are enormous when mature - if you've ever seen Tane Mahuta, you'll have some idea: it would take up much of this ground area on its own! We'd just come off the ferry from Devonport, where Jude and the two children, Jill, Bruce, Chris and I had gone for an outing and morning tea. Later in the day Chris and I wandered up the road from Jude's place to a nice wee pub and had a couple of beers until Rachel joined us and we had a cousin-chat for a while. It was really good catching up again, after so long. I'm hoping Chris will be able to get back here at some time, for rather longer than two days, so we can drag him up north and show him the real countryside! I flew home again and Chris went off to Thailand. Calves are born with eight bottom front teeth (and some number of molars, top and bottom). There are six incisors and two canines (an interesting name for bovine teeth, when you think about it), although the canines look exactly like the incisors to me! When they're babies, the calves' teeth look huge in their mouths, but by the time the adult teeth start appearing, those teeth have worn significantly, but are also in a much larger head, so look far smaller than they did. 426 has recently lost her front left incisor, from the red appearance of her gum, and the adult tooth is erupting rather crookedly in its place. You can see the first right incisor just under the tip of her tongue. This picture is just one of many I took while she was chewing her cud, trying to time the camera's operation perfectly, so as to get the best shot of all her teeth - they don't hold their mouths open, just so, on command! After watching those cattle for a while, I hopped through the fence for a close look at the steer, #356, and found that his wound is completely dry, no longer has any weepiness, in fact is now covered in proper skin! It will never grow hair again, but his body no longer has a hole where there oughtn't to be one. 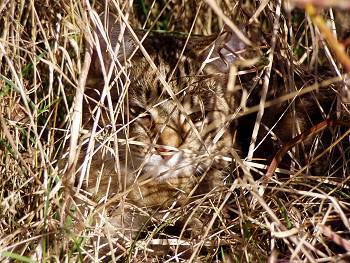 On Wednesday I took Spice to the vet early in the morning and picked her up again later in the afternoon, without her reproductive organs and with a couple of tidy stitches holding her together, with instructions not to make her walk miles to the back of the farm for a few days! On Thursday Stephan came home and things returned to a sort of normality. On Friday evening we went to visit my God-parents, since it felt like beer-o-clock again and were invited to join a fishing trip the following day!